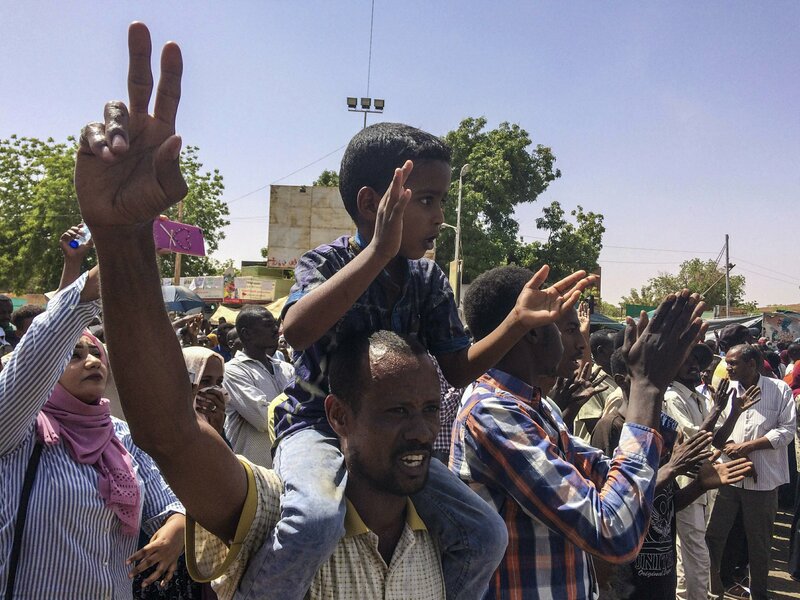 CAIRO — Tens of thousands of Sudanese were making their way to the center of the country’s capital on Thursday, cheering and clapping in celebration as two senior officials said the military had forced longtime autocratic President Omar al-Bashir to step down after 30 years in power. The circumstances of al-Bashir’s apparent ouster and his current whereabouts remained unclear, however. The armed forces were to deliver an “important statement” and asked the nation to wait for it, state TV reported earlier. The two officials, in high positions in the government and the military, told The Associated Press the army forced al-Bashir to step down and was now in talks about forming a transitional government. They spoke on condition of anonymity because they were not authorized to talk to the media. The swirling reports of a coup following nearly four months of street protests against al-Bashir’s rule raised expectations it was a sign the autocrat was relinquishing power or was being removed by the military. Pan-Arab TV networks said top ruling party officials were being arrested. They aired footage of masses they said were heading toward the presidential palace in Khartoum, waving the national flag, chanting, and clapping. Al-Bashir, who is a pariah in many countries, is also wanted by the international war crimes tribunal for atrocities in Darfur. Eyewitnesses in Khartoum said the military had deployed at key sites in the city to secure several installations since the morning hours. Armored vehicles and tanks are parked in the streets and near bridges over the Nile River, they said, as well as in the vicinity of the military headquarters, where thousands were anxiously awaiting the army statement. The witnesses spoke on condition of anonymity, fearing reprisals. Thousands of protesters, including women carrying their children, were making their way toward the military headquarters, many ululating and flashing “V″ for victory. There were also unconfirmed reports that the airport in the Sudanese capital had been closed. The development followed deadly clashes between Sudanese security forces and protesters holding a large anti-government sit-in outside the military’s headquarters in Khartoum, which also include a presidential residence. There were several attempts to break up the sit-in, leaving 22 dead since Saturday. On Tuesday, Sudanese security forces tried again to disperse the sit-in, which began over the weekend, killing at least 14 people, activists behind the demonstration said. The government said 11 died. The fatalities so far have included five soldiers who protest organizers said were defending the sit-in. The months of protests have plunged Sudan into its worst crisis in years. The demonstrations initially erupted last December with rallies against a spiraling economy, but quickly escalated into calls for an end to embattled al-Bashir’s rule. The protests gained momentum last week after Algeria’s President Abdelaziz Bouteflika, in power for 20 years, resigned in response to weeks of similar protests. On Saturday, marches in Khartoum marked the 34th anniversary of the overthrow of former President al-Nimeiri in a bloodless coup. It was one of the largest turnouts in the current wave of unrest. Since the current protests began Dec. 19, the military has stated its support for the country’s “leadership” and pledged to protect the people’s “achievements” — without mentioning al-Bashir by name. Army troops have deployed to protect vital state installations but have not tried to stop protests and, in some cases, appeared to offer a measure of protection for the demonstrators.